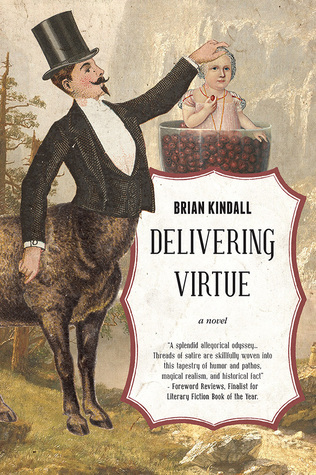 Delivering Virtue by Brian Kindall is a first book of the Didier Rain Epic series. The plot is based on an adventurous journey where the faith of the world depends on a girl. It's historical fiction. I like the thought process behind the cover page. The main character is Didier Rain. He is a deliverer, poet, and a broken man. He got a task to hand over an infant named Virtue to the City of Rocks. The girl is considered as a prime part of a prophecy, and she has to tie the knot with Prophet Nehi. The journey starts with a hope soon turns into violence, death, grief, and endless encounters which questions humanity and Rain's intentions. The story revolves around Rain's fantasy and his past incidents clearly affect his present life decisions. He developed a parental feeling towards Virtue, but with the time the story turns upside down. The characters feel torture and nuisance. This brings them close to each other. After a certain point, the readers can predict the few parts of stories because the male protagonist has a thing for beautiful women. Brian Kindall involves fairytales, biblical stories, American Indians and their traditions which make the story more gripping and fast-paced. I will not reveal the climax, but the end left lots of questions which leads the reader to its second book. The characters are dark and shady, but at the same time, they have light in their heart. The author portrays the passage in a compelling way, but I feel at some place it is unnecessarily stretched. The story narrates by Rain's POV. Virtue's character is dull and clumsy. While the other characters especially horses and a woman named Turtle Dove played a significant role. As an author, Brian knows how to play with words. The selection of vocabulary is praiseworthy. The writing is flawless. This novel is a mixture of dark humor and fantasy of a man which leads him to an unexpected journey full of twist and turns. If you like to read dark fiction, this book is perfect for you. Didier Rain is broke, lovesick, and just off a three-day whiskey binge. And yet, The Church of the Restructured Truth has been told in a vision that he's the man to fulfill their Holy Prophecy. He must deliver Virtue - a blue-eyed infant - 1,000 miles along the western pioneer trail to their prophet's stronghold as his child bride to be. Savages, zealots, and wildfire all stand in Rain's way, not to mention a list of Thou-shalt-not designed to thwart any man's most basic comforts. But, there's something holy about the job - something, Rain suspects, that might just turn his sorry life toward a better path.